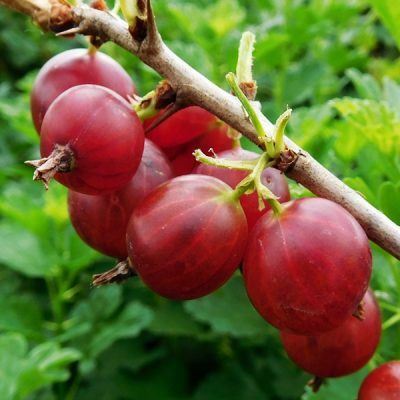 Gooseberries (also known as Ribes uva-crispa) are a popular soft fruit, with the varieties we sell coming in a number of colours. Some varieties are sweet and can be eaten fresh from the plant, while others can be very sharp. 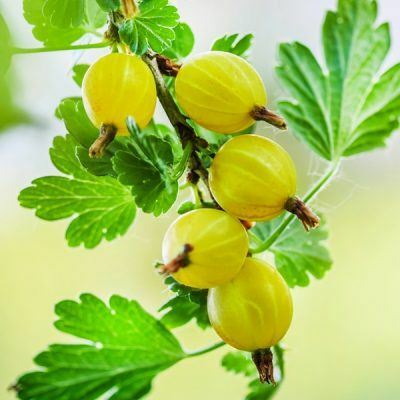 At James McIntyre, we have a number of top-quality gooseberry bush varieties for sale including the super sweet Invicta, the delicious Captivator, and Hinnonmaki Green, Yellow and Red. The bushes are generally very hardy and easy to grow. 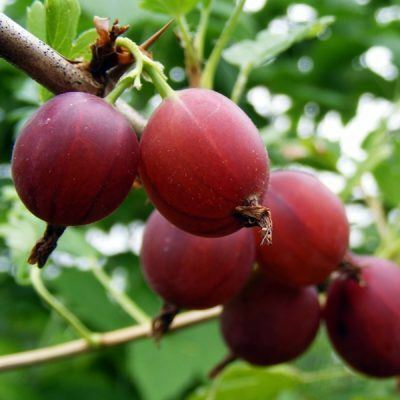 We can supply the bushes in 3-litre containers or bare-rooted gooseberries are available between late-October and late-March. 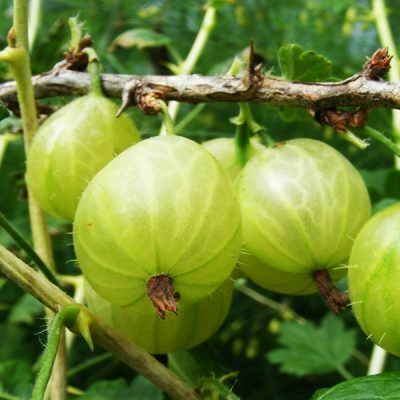 Invicta Gooseberries are an extremely sweet, yellow-green variety and are often used for culinary purposes such as jams, cakes and sauces. The Invicta also freezes well maintaining both its colour & shape. While the Invicta also produces a good crop of large fruits. Captivator bushes produce deep red fruits which are deliciously sweet. They can be eaten fresh straight from the bush or used for other culinary purposes. Originally from Canada, the Captivator is extremely hardy and can grow successfully in most climates. 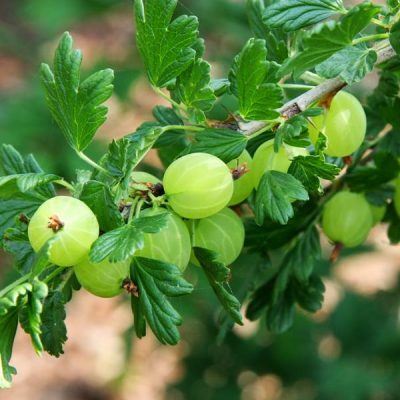 Hinnonmaki Gooseberry Bushes are originally from Finland and were bred to be very hardy plants with high resistance to diseases such as powdery mildew. Hinnonmaki is delicious eaten fresh or used in preserves or desserts. Cropping season is usually mid-July and we have green, red & yellow varieties available to order. Choose an open sunny or partly shaded spot, sheltered from frost & strong winds. Prefers slightly acidic soil, but must be free draining & fertile. Plant at a distance of 4-6ft (1.2-2m) apart. Prepare a 2ft x 2ft (60cm x 60cm) area at each planting spot by digging a hole approx. twice the diameter of the root-ball or pot. Line the bottom of the hole with fresh compost or well-rotted manure. If using manure, also ensure it is well mixed in with the soil. Plant with the old soil mark (if visible) level with the surface. Replace the soil by gently treading it back in and it is a good idea to apply a general purpose fertiliser mixed in with the soil at this time, ensuring the plants get the best possible start. Water in well. If planting between November and March cut back all branches by half after planting. If the plants are not protected by a fruit cage, then it will be necessary to cover them during winter to avoid birds damaging the buds. Occasionally due to frost, some plants may have lifted during the winter. Check for this, and carefully tread down any that may have done so. Regular weeding is important. Hand weeding is recommended, however, if using a hoe, ensure you don’t go too deep to avoid damaging the roots which can lead to suckers being produced. Watering is vital during spells of dry weather. It may be necessary to cover the plants at night during the flowering period (March/April) when frosts are forecast. Water in a general purpose fertiliser i.e. Growmore, in March. Once this is done, apply a mulch such as well-rotted manure or compost. This will help keep the soil cool & moist as well as keep down the weeds. Bear in mind that it is a good idea to cover the bushes when the fruit is beginning to ripe to keep birds at bay. If Mildew occurs, spray with an appropriate fungicide.